How Much Work Do the Bees Put Into Your Delicious Hawaiian Honey? Posted on July 20, 2015 by Hawaii's Local Buzz. Our delicious raw honey from Hawaii is truly a labor of love — on the part of the bees. It’s truly amazing that these buzzing insects are capable of producing such vast quantities of this sticky, sweet liquid. Thousands of bees work together to create each unique blend. A single honey bee can carry about 0.04 grams of nectar. If you consider that the average jar of honey contains about 454 grams, and that nectar is only about half as concentrated as the final honey, this means that thousands of bees must collaborate for just one jar of honey to be created. How many thousands of bees? Why, 22,700 to be exact! Bee colonies are remarkably complex social structures, and they are, in fact, home to thousands of bees. In an average year, the Queen bee will produce 100,000 – 200,000 worker bees, each of which dedicate about 10 – 20 days of their short little lives to collecting nectar for honey. This involves visiting thousands of flowers per day, and shuttling the collected nectar back to the hive. Even concentrating the nectar is not a “wings-off” process for the bees. They flap their wings over the nectar to encourage the water to evaporate more quickly. As the bees collect nectar and transform it into honey, some of it is used up by the hive as fuel. However, since the bees make an excess, this excess can be collected and used by beekeepers. 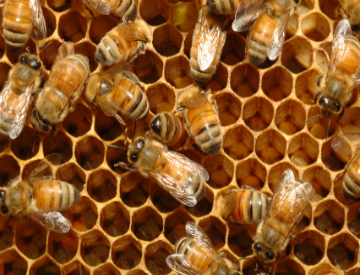 Our raw honey from Hawaii is produced with the utmost respect for the bees. We rely on these little creatures to select the tastiest nectars from around the Big Island, and to blend it together into the most perfect honeys. Visit our website to try some of our unpasteurized, local honey for yourself.